"This is a very simple, yet delicious end to a grilled meal. 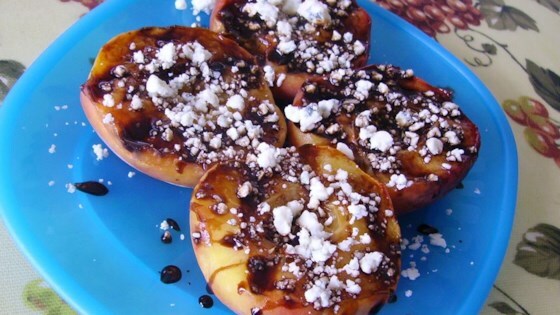 Peaches are grilled with a balsamic glaze, then served up with crumbled blue cheese. A sophisticated, yet extremely simple recipe. Perfect for summer entertaining!" This dessert is super rich. I don't think there's any way one person can finish a whole half a peach - it's just soo rich. It does taste good, but I only got through two bites. Simple to prepare, attractive presentation with an excellent and different blending of tastes and textures. It was delicious and easy to make! I loved the blue cheese my wife did not, in the case of a non blue cheese fan I may substitute cream cheese.